Popular with both cooks and the health conscious, celery is one of the most versatile vegetables available. While it’s commonly found in the grocery store and used in a variety of preparations, celery is not commonly grown in the home garden. This is due mostly to the fact that it is one of the more difficult vegetables to grow. Celery requires cool temperatures, a long growing season, and lots of water along with plenty of TLC to avoid dry, stringy stalks. If you’re interested in tackling this finicky vegetable in your garden, you’ll no doubt reap the rewards of your effort when you’re enjoying the taste of freshly grown celery which far surpasses that which you purchase at the supermarket. There are only two varieties of stalk celery, self blanching and trench, available to grow in the home garden. In North America, green or Pascal celery is most popular. It is eaten both raw as well as cooked. 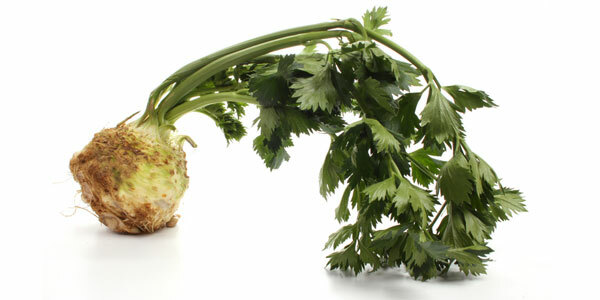 Other parts of the world commonly use self blanching or yellow celery in their cooking. Celery that requires blanching, a process of surrounding the base with dirt so that the stalks do not turn green, are seldom grown in home gardens due mostly to amount of extra work required to grow them. Finding the right place to grow your celery is essential to a successful crop. Begin by finding an area with full sun (at least 6 full hours). The temperature must remain cool in order for celery to grow. Daytime temperatures should be between 65 and 75 degrees Fahrenheit. Nighttime temperatures should be 60-65 degrees Fahrenheit. If the temperatures in your area are not close to these ranges, avoid trying to plant celery as it will not be successful. You’re better off just getting your celery at the store. This temperature range will need to be maintained for approximately 5 months as celery has a long growing period. If frost comes before the celery is harvested, it will easily ruin the entire crop. The soil should be rich and able to retain moisture as this is a key component for avoiding stringy celery. To increase the richness and moisture retention, loosen the dirt and mix in plenty of organic compost or manure. It is best to prepare the soil several weeks prior to planting the seedlings or seeds. The acidity of the soil is another factor to consider. Celery requires soil with a pH of 6.0 – 6.5. There are soil testing kits available at most gardening or home supply stores, or you can have your soil tested by a professional to find out if any adjustments are necessary. Celery seeds are difficult to get started and thin out. Due to this, it is recommended that you start your plants indoors (4-6 weeks prior to the last frost) and transplant seedlings when the temperature is right and the plants have had a chance to get a good start. This also allows you to extend the growing season if needed. Begin by placing a few seeds into a small container filled with prepared soil. Celery seeds are very small, try to plant around 5 in each container. Once the seeds begin to sprout and can be thinned, remove all but 2-3 plants from each pot. Thin the pots a second time when the plants become larger to just one plant per pot. Seedlings are ready to transplant when they reach about 3-4 inches in height. When the threat of frost has passed and the soil has been prepared, you are ready to start hardening the seedlings. To harden the seedlings, place them outside during the day, but bring them inside at night until the temperatures are warm enough (consistently above 50 degrees Fahrenheit). After about 15-20 days of hardening the seedlings, you will be ready to transplant your seedlings to your garden. Carefully remove the plants from the container and plant them 12 inches apart and slightly deeper than they were in the containers. Rows should be spaced 2 to 3 feet apart. Place a fence or gardening net around the area, along with a wind chime or wind-catcher to help deter birds and other garden pests. Water regularly to ensure that the soil stays moist. This is one of the most important steps when growing celery as it helps produce the full crunchy stalks that make for great snacking. Applying a layer of mulch around the plants will help to retain moisture and keep weeds to a minimum. Celery also requires frequent fertilizing. Apply a fertilizer every 2-3 weeks throughout the growing season. Be diligent in removing all weeds as they will compete with the celery for both water and nutrients that are essential to a successful crop. It will take approximately 120 to 140 days for the celery to mature. Once the celery has reached a height of approximately one foot or more, it is ready to be harvested. The outer stalks will most likely be tougher and can be used for soups or stews. Inner stalks are more tender and better for eating raw. If you would like just a couple of stalks, remove them from the outer parts of the plant, being careful not to disturb the rest of the plant. Allow the inner stalks continue to grow and develop. You can also remove the entire plant by cutting it off at the base, keeping the stalks intact, or remove the root as well. Wash the celery in cold water and refrigerate. Celery will stay fresh for a couple of weeks in the refrigerator. Celery is susceptible to several diseases including leaf spot and blight. Bacteria can also cause rotting in the center stalks. Any of these problems should be treated quickly to avoid damaging the entire crop. If the stalks of the celery are splitting, it is a sign that the conditions are too warm and/or too dry. Keeping the soil moist is a necessity to proper growth. Frost is very dangerous to celery and plants should be protected at all costs. If there is a threat of frost at night, cover the plants to protect them. Stems can be blanched by keeping the light from reaching them. This can be easily accomplished by tying the center stalks together with a piece of string. This helps reduce some of the bitterness of the plant. You can also build up the soil around the plant about a month before harvesting to blanch the plant. Beware of pests such as slugs, aphids, leafhoppers and celery flies that can attack and destroy a celery plant. Enjoy the rewards of all your work and attention to your precious celery plants! Unfortunately, I do not have a tip on growing celery, I am looking for them, though. I have appreciated everything I have just read on growing celery in this site. My problem is growing celery in a tropical country, where there is too much sun and hot temperatures, most of the year round. Once, I had the chance to meet a celery grower, a Japanese descendent, in Brazil, but he did not open his mouth and keeps the secret. I and my husband grow organic veges and celery is our goal. We will be grateful for a help. I also have not grown celery and am gathering tips for that purpose. I have heard somewhere in Israel, they are growing celery start to finish in buckets of sand/soil mixture. I would love to find more information about this. instead of earthing the soil up around the plants, which can harbour pests , try placing a piece of 5 inch diameter and 12 inch long drainpipe over the plants . this will keep the stalks clean and some pests at bay . it is also easier to weed , feed and water around the base of the plants this way . Last year, my neighbor gave me 4 celery plants since she ran out of room to plant more for herself. I had absolutely no more room to plant any more plants so I decided to try planting these four plants in containers. I have never tried planting celery before and I thought, what the heck, if they didn’t grow, then the leaves on them would pretty green and go nicely wih my other container veggies (ie. patio tomatoes and pepper plants). As little research that I did to educate myself on growing celery, I was surprised that my celery turned out as good as it did. This year, I planted celery again. I decided at the last minute to grow it when I found plants for sale at my local Giant Eagle store here in Pittsburgh. I paid $3 for a pot of 4 starter plants that were about 5 inches high. Again, I planted them in my huge flower containers. This year, the weather is way cooler and wetter than it was last year. I have noticed the difference in how much more healthier my plants look with all of the rain we have been getting. My celery looks fabulous! The taste of it is so fresh, and moist. I have never tasted celery that was this good from any grocery store. I came upon this site while doing some research on another vegetable plant. I was shocked at all “the care” they are saying you must give to celery plants. To tell you the truth, My celery is doing wonderful just the way I am growing it. I love cutting stalks as I need them for dinner. It tastes so good and fresh in salads. And all I do with my celery is plant it, water it and keep it in a spot on my back patio where my plant gets a good 6 hours of sun a day. I don’t fertilize, with the exception of one treatment of miracle grow shake and feed about a month after my plants have been put into the containers. There are times I have forgotten to water my plants but they get plenty of water from all the rain we have been getting. To me, I honestly think that celery is the simplest plant to grow. I have had no problems with bugs or slugs eatting away at my plants either. However, I admit, I have never tried growing celery from seeds. I am better at growing from plants. I have never had any luck growing my veggies from seeds, no matter what kind of veggie it is. So all of my plants, I purchase as starters. i planted the celery heart after removing all the stalks from a bunch of celery i bought at the market. we grew four plants that way, just barely in the ground. they all rooted and grew new stalks. next year i will try quartering a celery heart and see if i can get four plants from one. i live in janesville, wi. so i’ll start them inside in late winter. give it a try, so easy to grow celery that way. I was shocked to read that celery is greatly affected by frost. Last year I started a small garden in a 6′ X 8′ box. Towards the end of the summer I had bought a celery plant, on clearance from a local greenhouse. I planted it in the center of the garden and nothing much happened with it except that it got real leafy, not much height, so I never harvested anything. I had never grown celery before so I just left it in my garden where it literally stayed green all winter long! We had tempatures as low as 30 degrees below zero this past winter and lots of snow and all winter I could see some green (crunchy-looking) leaves in the middle of my box. I didn’t really think that the plant was still alive, but lo and behold this past spring new shoots started popping up and now that plant is 3 feet tall and each night I snip off a few stalks to use in whatever I am making for dinner. I haven’t done a thing to that plant and it is doing great. Although now it looks like it is going to start to flower and I don’t know what that will mean for my future harvesting expectations. I have just grown my first lot of celery. However they have now gone to seed and they only ever developed one central stalk with several thin “branches”. It has never developed the typical crescent shaped celery stalks I was expecting. Can someone tell me what might have gone wrong? Is it the variety?